Microsoft has unveiled new accessibility features for OneNote, the company's collaborative note-taking app for Windows, macOS, iOS and Android. According to the company, the update provides a new design that's focused on ease of use for all learners, with particular emphasis on features for those with mobility impairments and for those who use screen readers. That includes a simplified navigation structure and added consistency across platforms, as well as improved keyboard shortcuts. 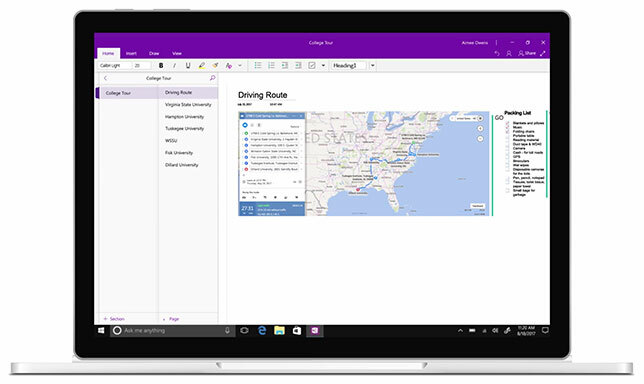 "With the goal of making usage of OneNote within the classroom more accessible and accommodating for students with varying learning styles and abilities, the OneNote team embarked on a year-long journey listening to teachers and incorporating feedback to help inform the redesign of OneNote's user interface," according to information released by Microsoft. "The OneNote redesign brings consistency across apps, improves usability for those with vision and mobility impairments, and simplifies navigation controls." Microsoft is also offering a new accessibility training course for educators on the use of Office 365. The course is designed to train teachers — especially special ed teachers, though it's open to all — in the creation of accessible documents, revision of older documents to make them accessible and use of Office tools like Skype Translator and Office Lens for accessibility. The course is free for educators, administrators, parents and students.